Asthma is a particularly troublesome condition. Its main symptom is a tightening of the airways. People having an asthma attack can find it very difficult to breath. Drugs and vaccines are often used to treat the symptoms of asthma. Asthma can be both allergic and non-allergic. Allergens that commonly trigger attacks are animal dander, pollens, mold, chemicals, drugs, dust mites, food additives, seafood, dairy products, and tobacco smoke. Non-allergic causes of asthma include adrenalin disorders, temperature changes, exercise, extreme dryness or humidity, fear, low blood sugar, and stress. There are many health-care practitioners who feel that asthma is treatable. They don’t consider asthma to be a chronic, incurable disease. An allergy, which is the primary cause of asthma, is in itself, a sign of a compromised immune system. And one surefire way to boost the immune system is by eating healthy, natural foods every day. Brown rice and whole grains. Try to keep your intake of carbohydrates low, get lots of protein, and try to avoid sugar. Garlic and onions are great to add to your meals — they are high in something called quercetin and mustard oils, which have been proven to inhibit the release of inflammatory chemicals. Eating spicy foods may help, too. Garlic and onions, could all make breathing easier for you by opening up your airways. It is believed that these foods have the ability to remove mucus from your body and to thin out viscous mucus, which might otherwise plug up your airways. Spicy foods stimulate nerve endings in your digestive tract, causing them to release watery fluids in your mouth, throat and lungs. Turmeric has also been used in the treatment of bronchial asthma. It acts best when taken on an empty stomach. Another herb to try is lobelia extract. Lobelia is both a bronchial muscle relaxant and an expectorant. As far as herbs go, Frankincense, or boswellia, has been proven to reduce asthma symptoms and reduce the number of attacks. In one clinical trial performed at the University Tubingen in Germany, the gum resin of boswellia was used in a double-blind, placebo-controlled clinical study. 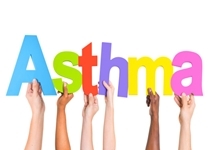 Eighty patients (both males and females) between the ages of 18 and 75 years old suffering from chronic asthma participated in the study.Half the patients were given a preparation of gum resin three times daily for a period of six weeks. The other half of the patients acted as the control group and received lactose three times a day for the six-week period. The researchers discovered that the group receiving the boswellia gum resin had a 70% improvement in their asthma condition. Only 27% showed improvement in the control group.